WAIST HIGH: Happy 25th Birthday The Gift. Happy 25th Birthday The Gift. Reaching #1 on the British charts in 1982, Waist High favorite The Gift was the final studio album by The Jam. 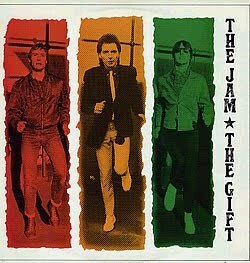 From their debut In the City in 1977, to The Gift in 1982, The Jam had 18 top 40 singles in the UK, including four number ones. Not every critic's favorite, The Gift delivered "Precious," "Happy Together," "Carnation," the great "Town Called Malice," which entered the chart at number one, and the beautiful "Ghosts," which "looks at our own insecurities against a simple click beat and vocal with one of The Jams sweetest ever." Conceived by a "thriving Weller as a new direction in pop, on The Gift he aspired to perfection, sometimes reaching his goal, sometimes hitting the post, but nearly always on target when it came to passion and integrity, and keen to capitalise on The Jam's status as Britains best loved band."